Amidst the intervals, data, devices, diets and all the other ways that athletes are trying to “gain an edge” in endurance training, it can be easy to forget the basics. The number one most important rule of training, which is often forgotten, is consistency. There is no training program or workout any coach can devise that can make up for a lack of consistency in training. The higher your goals are as an athlete, the more important consistency is. As a coach, I repeatedly see the differences in performance and improvement between the athlete who is consistent in their training and the athlete who isn’t. You lose fitness at a rate of almost three times as fast as you gain it, so missing a workout or two may not hurt you, but miss a few on a regular basis and you will have a hard time making performance gains. You have to make training a daily priority. One of the best ways to see how consistent you are in your training is to follow your Chronic Training Load (CTL) in your Performance Management Chart (PMC). The PMC is a Premium feature within TrainingPeaks® and is also available in TrainingPeaks WKO+. Your CTL is a 42 day exponentially-weighted average of your daily Training Stress Score® (TSS®). It is very representative of your fitness level since it rises slowly as you accumulate workouts, but falls very quickly when workouts are missed. Your daily TSS score is determined after a swim, bike or run automatically provided you have set your Functional Threshold Power, Threshold Pace or Threshold Heart Rate values. On the bike, power is the most accurate way to measure TSS while on the run pace is the most accurate measurement. In both cases, heart rate can also be used to gain an accurate TSS value. An accurate daily TSS is crucial to maintaining an accurate CTL. You can read more about TSS and threshold here. Here’s an example of excellent consistency represented by the nice, steady climb of the CTL (blue line). This is pictured in TrainingPeaks WKO+ desktop software. You can see this athlete’s CTL rising at about 10% every two weeks through the final 5 plus months heading into the peak CTL and taper. Though the amount of your increase may vary on a weekly or bi-weekly basis, this consistent rate of increase in the CTL shows the athlete has been very consistent in training. A steady increase in training stress average also helps to limit injuries, sickness and over-training, which leads to performance gains. Here’s an example of an athlete who lacks consistency in their run training. The blue CTL line doesn’t rise steadily, has large gaps and drops, and never really changes much in value from late January to mid-September, (low of about 20, high of about 33). You’ll notice in the inconsistent chart that I overlaid the athlete’s top 10 run performances for different time intervals, ranging from 6 minutes to 2 hours, for this period (speed is in kph). Where the athlete had the most consistent and steady training, in the first third of the chart, is where the largest concentration of top 10 performances are. This isn’t just a coincidence. 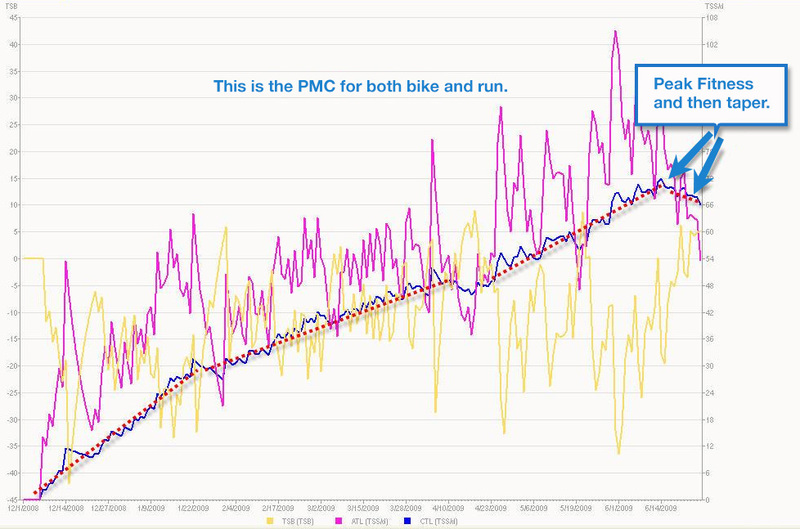 Now look at this next PMC and you can see the lack of consistent training for the first half of the year, before the athlete changes and gets consistent in his training. The result is a huge concentration of top 10 performance outputs from 6 minutes to 2 hours, all clustered near each other, as the athlete heads into his peak race. This is visual, graphic proof of the benefit of consistency in training. 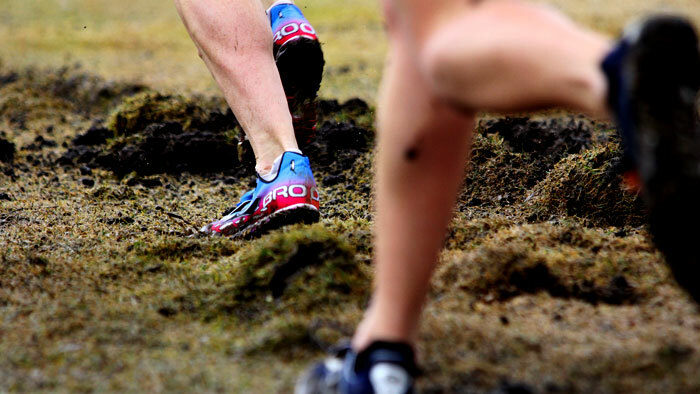 An athlete wants to see their best performances of the season happening in the most recent past and in the build-up to their “A” race, not spread out randomly over the course of the season. Take a closer look at your PMC, specifically your CTL, and assess how consistent you were throughout your season. You can also look to cross-reference these charts with your TrainingPeaks training log to see when you might have over-reached in your training, wreaking havoc on your consistency. This allows you to better assess how to prescribe your training loads in the future. Get your consistency right, make your training a daily priority and you will likely see a great PMC. More than just a good looking chart with clusters of your best performances, you will achieve results when it matters the most.